Greetings, Programs! Both Disney’s “Tron: Legacy” and the original groundbreaking “TRON” come home on Blu-ray and DVD on Tuesday, April 5, 2011. Neither film received critical acclaim at the box office, but both have developed strong fan followings from “users” who wish they could enter “the Grid.” With this home release, Disney is not only giving fans the chance to experience these unique films again, but also offering hours of additional entertainment. The original “TRON” was released in the early 1980s, a time when computers were new and frightening to many, not yet having found a place in homes. “TRON” was far ahead of its time, predicting a world in which people would interact in cyberspace by way of alternate personas. The movie was the first to extensively use computer graphics, seen by Hollywood at the time almost as “cheating,” with traditional artists and model-makers afraid for their jobs. As a movie today, “TRON” stands out as being far ahead of its time. Its effects look rather dated, but appreciation for its cinematic accomplishments (and general geeky tone) has kept this film desirable for decades. “Tron: Legacy” aimed to introduce a new chapter to the first film, placing the son of the original’s main character, Kevin Flynn, in a similar situation, having been surprisingly scanned onto the Grid. Like the first film, “Tron: Legacy” has been panned by some as having a story that either isn’t followable or simply isn’t good. I personally disagree, having found the new film to be just as much fun (if not more) than the original, with the story and characters interesting. (My full film review can be heard in Inside the Magic podcast Show 298.) “Tron: Legacy” offers viewers a chance to once again step into that computer world from “TRON,” but with some of the most unique style seen in a Hollywood film in quite a while. The slick look is backed up by solid acting and an outstanding score by Daft Punk, creating a fun-filled sci-fi adventure. “Tron: Legacy” and “TRON” come home in a number of different releases and formats. It’s the first time Disney has made “TRON” widely available in many years, now with a worthy home release. The two films come bundled together in a 5-disc Collector’s Edition (which includes a light-up Identity Disc) and a 5-disc Combo Pack (without the Identity Disc). Each film is also available individually in 2-disc Combo Packs, offering Blu-ray and DVD copies as well as DVD standalone releases (“Tron: Legacy” Blu-ray 3D / Blu-ray / DVD, Blu-ray/DVD & DVD, “TRON” Blu-ray/DVD & DVD). Of the many release variations, the most impressive packaging is in the Collector’s Edition, offering fans a fun Identity Disc case for the many Blu-ray and DVD discs. 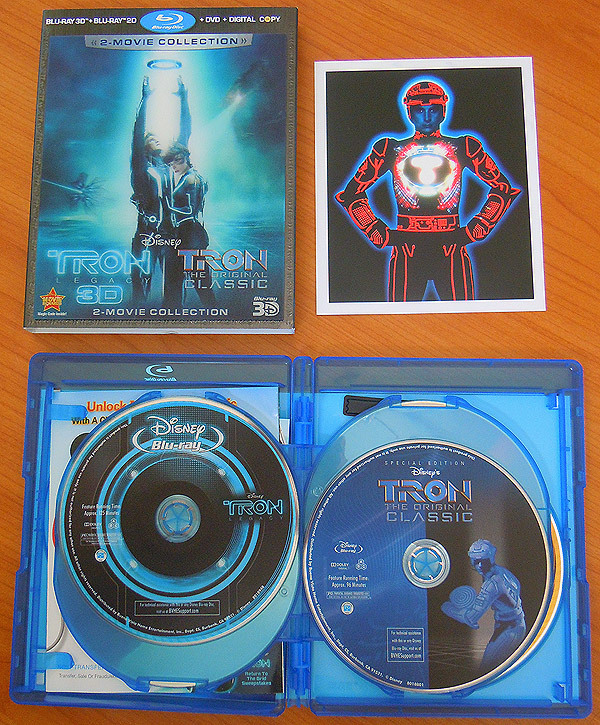 But the 5-disc Combo Pack offers a collectible of its own, with the lenticular card cover presenting a 3D version of the “Tron: Legacy” poster image, featuring Sam Flynn (Garrett Hedlund) and Quorra (Olivia Wilde). The “Tron: Legacy” discs themselves are designed as Identity Discs, naturally, featuring different colors from the film. Also included with the combo packs is a collectible card print featuring the iconic likeness of Bruce Boxleitner as TRON, the character from the original film. Just the packaging design alone is enough to excite any TRON fan. I thought I would have to review the visual quality of each of these two films separately, with “Tron: Legacy” far newer of a film than “TRON.” But as it turns out, both look equally fantastic. “Tron: Legacy” shows off a sleek digital world which presents itself beautifully on Blu-ray and DVD. The majority of the film’s aesthetic relies on shades of black, illuminated by lines of light that run along all locations, objects, and outfits. The dark backgrounds translate into outstanding black levels at home, with bright lights never washed out. The contrast produces a beautiful combination, free of any compression issues. Even the computer-generated Clu character, representing a young Jeff Bridges, looks lifelike. “Tron: Legacy” is presented at home in a mixed aspect ratio, jumping between 2.35:1 and 1.78:1. Theatrically, the film featured several scenes in IMAX format and the home release preserves the original aspect ratio of these scenes, rather than unnecessarily matting them. It’s a touch that is sure to excite film enthusiasts who enjoy watching movies as the directors have intended them, rather than dealing with cropped variations that have sprung up over the years. Vast improvements have been made to enhance the overall feel of the original “TRON” for this release. For a film that was released decades ago, it looks crisp and clear in HD on Blu-ray. Earlier releases of this film suffered from flickering wherever the colorful lines of light were composited onto the frames as part of its original production. But this new release greatly reduces that flicker, creating a far more enjoyable viewing experience. The effects themselves remain the same. It’s not a “special edition” treatment. But “TRON” is enhanced, overall, and looks better than ever. Of these two films, only “Tron: Legacy” is released in 3D, having been shot that way. And if there was ever a film that makes incredible use of 3D technology, this is it. Where some films are hurt by home 3D technology, darkened by glasses and suffering from other technical issues, “Tron: Legacy” thrives in the third dimension. 3D effects in the film are subtle. There are few “in your face” moments, instead relying on a sense of depth and place throughout. 3D lens flares and glare are added to catch the eye at times, without ever being distracting. Disc wars and light cycle races become even more exciting when witnessed in 3D. It’s stunning enough to make anyone want to rush out and buy a 3D TV and Blu-ray player, offering the ultimate home theater demo. Even the Disney movie previews look phenomenal in 3D, with “Pirates of the Caribbean: On Stranger Tides” enhanced by the technology. The trailer for Cars 2 looks great in the third dimension as well. The 7.1 DTS-HD Master audio in “Tron: Legacy” makes good use of the surround technology, particularly with Daft Punk’s score. Songs that are completely enjoyable in 2.0 stereo come to life with electronic sounds bouncing around a 7.1 system. The film’s soundtrack never slips into the world of corny computer “beeps,” instead offering computerized versions of real-world sounds that are recognizable and yet slightly unfamiliar. Music aside, ambient sound is eerily silent in much of the film, with the occasional distant and gentle thunder overheard, emphasizing the hyperreal simulated atmosphere effects present on the Grid. “TRON” features a new 5.1 DTS-HD Master audio track that does wonders for the film’s original soundtrack. Despite the audio being decades old, dialogue comes across clearly, though sometimes a bit too hot. Wendy Carlos’ score, which is filled with computer “beeps,” ricochets around, enhancing the colorful computer world. Fans of TRON will be delighted by the vast array of bonus features present on both the “Tron: Legacy” and “TRON” releases. From making-of bonus features to newly-shot shorts featuring the films’ actors and characters, there are hours of enjoyment to be found on these discs. On the “Tron: Legacy” Blu-ray and DVD releases, bonus features “Visualizing TRON,” “Installing the Cast,” and “Launching the Legacy” give a look behind-the-scenes at how the movie was first cast and then ultimately made. It’s incredibly interesting to hear how involved some of the cast members were, some even revealing their own personal love for “TRON.” The “Disc Roars” bonus feature puts viewers in a high-energy hall at the San Diego Comic-Con while “Tron: Legacy” director Joseph Kosinski informs the audience that they’ll be recording crowd sounds for the film. The result is pure geek joy. Daft Punk’s “Derezzed” music video returns viewers to the style of the original “TRON” but with a modern twist. A sneak peek of the upcoming 2012 Disney XD animated series “TRON: Uprising” gives TRON fans something to look forward to. Exclusive to the “Tron: Legacy” Blu-ray release is an incredible new short, “The Next Day: Flynn Lives Revealed,” which picks up where the online “Flynn Lives” campaign left off. It all takes place just after the original “TRON” ends, offering a look at what happens in the world of Encom when Kevin Flynn disappears. Fans who followed the online videos (which are also offered in HD on the disc) will absolutely love this finale, starring a few familiar faces from the original film. Following “The Next Day,” users are presented with a video game high score screen where initials can be entered to access more video features. It’s possible that some hidden easter eggs have yet to be found by way of this screen. Unfortunately, the Disney Second Screen bonus feature for “Tron: Legacy” is not currently ready. When it launches by April 5, it will allow iPad or computer users to see additional bonus content in real-time while watching the film. I’ll update this review once it’s available. The new release of “TRON” features all of the older DVD bonus features, of which there are many, as well as two new Blu-ray exclusive features. “The TRON Phenomenon” gives “Tron: Legacy” stars a chance to weigh in on why “TRON” has become a cult classic and how it has influenced not only the movie industry but pop culture and the computer science world over the years. “Photo Tronology” is a particularly unique bonus feature, taking viewers on a nostalgic ride to the Disney photo archives along with “TRON” director Steven Lisberger and his son, Carl Lisberger. It’s a fun spin on a typical making-of featurette, essentially revisiting the set of “TRON” by way of archived photos. “Tron: Legacy” and “TRON” are greatly enhanced by the new Blu-ray releases. Both films and sound look outstanding when translated to the home screen, with “Tron: Legacy” given the edge by the stunning use of 3D technology. It’s the first example of home 3D I’ve seen that actually improves upon the 2D version. Beyond the films, these releases offer the ultimate in bonus features, diving into every aspect of the creation of the movies, from concept design, to casting, to production, to visual effects, and beyond. These making-of features coupled with newly-shot footage that amounts to a short film (TRON 1.5, if you will) offer an exhaustive collection of entertainment and insight into the world of TRON. Users can’t buy this release quickly enough. End of line. Great review; can’t wait to get my hands on a copy as well. Just a simple question: what is the 3D TV you test these reviews on? And did you notice any crosstalk in the 3D picture, which apparently happens quite a lot on some 3D TV models? I tested this release and Tangled on a Panasonic display at Best Buy. Tangled suffered from severe ghosting and floating artifacts… but Tron: Legacy looked flawless, as did the Pirates 4 and Cars 2 trailers. I have been looking everywhere but can’t find an answer. Is the original copy that comes with it blu-ray or standard? 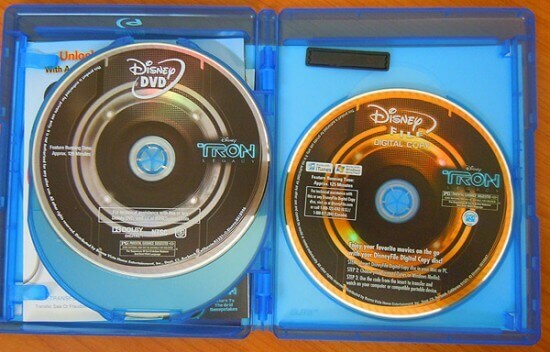 The copy of the original TRON in the 5-disc set is on Blu-ray. The five discs are: Tron: Legacy Blu-ray 3D, Tron: Legacy Blu-ray, Tron: Legacy DVD, Tron: Legacy digital copy, and TRON Blu-ray. Sorry, but I have to correct you: the 4-disc edition is the 3D blu-ray version, but doesn’t come with the original TRON. You’re right. I fixed the links above. Thanks!